If someone asked you what the most coveted Tetris piece was, you'd instantly say the straight line, right? After all, you're always building your stack to leave a thin gap down one side so that when a straight piece does fall, you can clear out four levels at once. 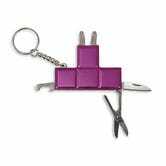 But in real life, at least thanks to this multitool, the T-shaped tetromino is far more useful.